I embossed the card base the woodgrain embossing folder and then lightly rubbed my white craft pad over the raised woodgrain design. I set that aside to let it dry. The window frame is cut from whisper white cardstock. 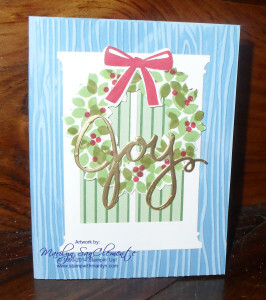 The wreath is a 3 part stamp which I love!! Very easy to get a great color assortment without having to use markers and color in a stamp. The larger portion of the wreath is stamped using Pear Pizzaz ink. The less dense piece of the wreath is stamped with old olive to add darker leaves. The berries are stamped with Real Red. The Bow is also stamped with Real Red. This set also has matching framelits which I love!! I cut the Joy out using Gold Foil and added that on top of the wreath! 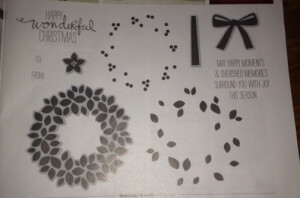 I also made a Card with the White Christmas stamp set which I will post tomorrow! I just love this set! I love how wonderfully easy it looks to use, it will be the first set I purchase from the mini if I ever get around to it! So glad you played along with my sketch challenge this week! I am happy to see how nice this cuts. Awesome card.